This Howard Hawks Western has been analysed to death so maybe that is where we should begin. In ‘Rio Bravo’, John Wayne plays the sheriff, John T Chance. He mentions death rarely and when he does he is invariably dismissive. There is no mention of God or the afterlife. Responding to a threat from Nathan Burdett, the sheriff grins and says, ‘Who cares? If that happens, we’ll all be dead.’ Later, with the help of teenage gunslinger, Colorado, and an old man called Stumpy, John T Chance kills three men that have been hired by Burdett. Chance looks at the three dead men and says, ‘Wake up the Chinaman.’ Chance means the undertaker but in the dark his words sound like a reminder that there is nothing left after death, nothing we understand. 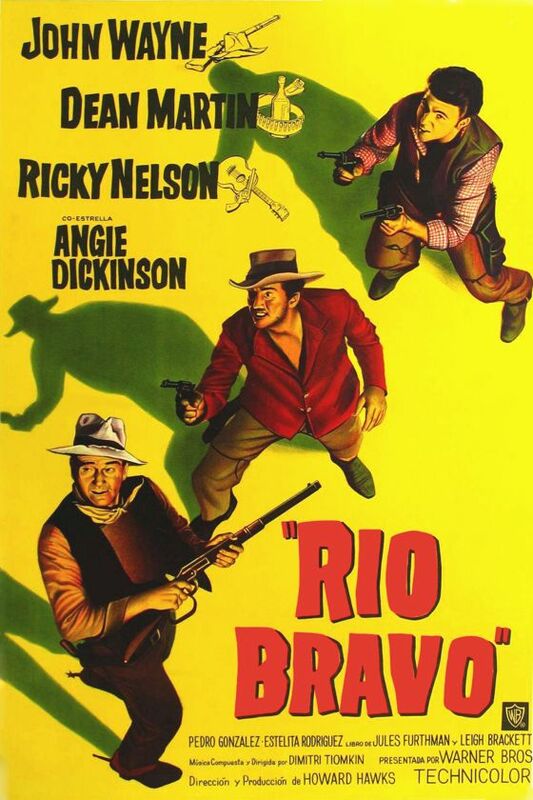 Hawks may think that grief is phony but ‘Rio Bravo’ is not tempted by nihilism. Unlike the classic, ‘Wild Bunch’, it does not view existence as inconsequential with the only mitigation being glorious sacrifice. All that happens when someone dies in ‘Rio Bravo’ is that the Chinaman is wakened. People move on. This conversational parsimony over death is deliberate. 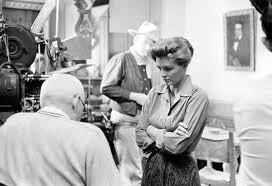 The movies of Howard Hawks emphasise life. Hawks consistently maintains that although human beings may not be perfect their lives do have significance. Death means they have to move over but while they are here they are important. Hawks also adds a caveat. Significance will only be obtained by those humans who are ‘good enough’. This means that they will be competent at what they do, be loyal to those around them and not imagine that they are better than others. Of course, that sounds a little like Elvis but the two men have much in common. Both have been defined as American artists, neither are restricted to single genres and both manage simultaneously to wave the patriotic flag and be subversive. There is no celebration of nature in ‘Rio Bravo’ just as there is none in the music of Elvis. Chance and his gang stay in the town throughout the film, and we are spared shots of the landscape. These men will not shape history. What makes their lives memorable is their ability to connect to others. The men in the films of Hawks are not sensitive. They will tease each other with rough talk and sometimes give offence that could have been avoided. None of them are qualified to help Dude recover from his alcoholism but they are a help because they are loyal to someone they could have abandoned. When Stumpy complains to Chance that the sheriff does not appreciate him Chance kisses Stumpy on his bald head. The gesture implies that sensitivity should be treated with contempt but it also serves as an affectionate moment of intimacy between two men. Hawks has always argued that men who are serious about responsibility and have to risk danger are obliged to be callous. Self-respect for them means strength gained through endurance and not relying on the concern of others. Outsiders will view this as glib cruelty. In an earlier Howard Hawks film, ‘Only Angels Have Wings’, Cary Grant upsets Jean Arthur because he eats the steak that has been prepared for a dead pilot. His friends and workmates will know, without being told, that their grief avoiding friend has purpose and is capable of reliable support. 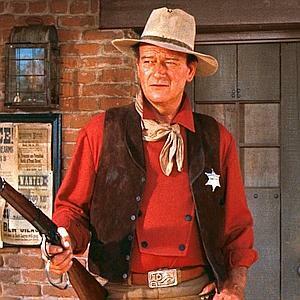 The sheriff of ‘Rio Bravo’, John T Chance, is a typical Hawksian hero. He can be caustic with his deputies yet is tongue-tied with ex-saloon girl, Feathers, who controls their relationship from the very beginning. Chance is not an individual who needs to change and own the world to experience valuable worth. This is what makes him different from Nathan Burdett who thinks only power is important. Their understanding of real personal worth also makes Chance and his odd crew superior to the nondescripts hanging around the saloon, lackeys seduced by the powerful. Chance and his friends want responsibility and enjoy being of value. Colorado has no intention of taking part in the fight of Chance but once he becomes involved he stays committed. Like the rest of the group, Colorado refuses to complain about an unfair world. It is the ability to endure that makes them strong. Chance makes demands of his team but always as an equal. They are allowed to be critical of Chance and contribute important ideas that help Chance succeed. All of them are people who others would have rejected but Chance only survives because of them. Dude is a recovering alcoholic, Stumpy is ‘an old cripple’, Feathers is a saloon girl whose name adorns wanted posters, Colorado is an effeminate teenager and Carlos is a short Mexican who can be confused easily by American ways. But the Sheriff gives them all a chance hence his surname. When Chance assumes Feathers has stolen cards from a poker game because he has previously seen her face on the wanted poster it is the one occasion he lapses. He has failed to live up to his name but when corrected he makes amends by letting Colorado take charge and challenge the guilty man. Today, some find the treatment of Carlos a little racist. The confused Mexican is a source of humour but the film does not deny the worth of Carlos. The Mexican insists that in his hotel Chance does not tell Carlos what to do, and after the card cheat is arrested it is tiny Carlos who puts the crook in guarded premises. Although he lacks the skills of the others, he takes part in the final shootout. He is an equal member of the group. 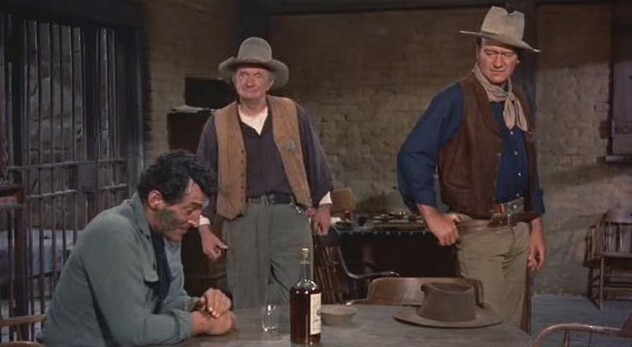 The emphasis in ‘Rio Bravo’ on the importance of self-respect and personal responsibility for doing a job, plus the presence of John Wayne, will no doubt convince many on the American right that Hawks supports their individualism. 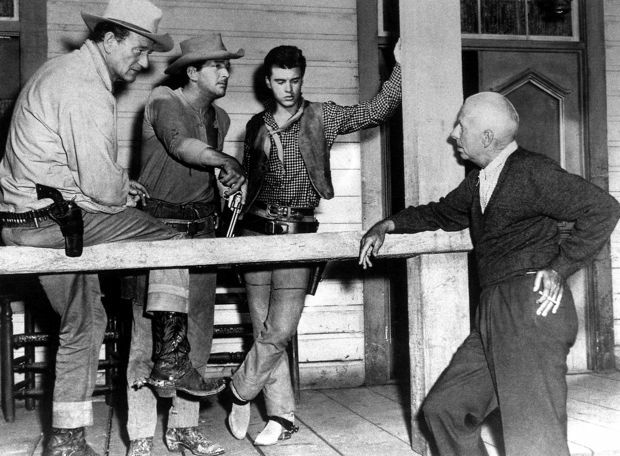 But the world of ‘Rio Bravo’ inspires because it accommodates the weak and finds a role for them. John T Chance is not a frontier individualist. He is willing to nurture the flawed and unfortunate. ‘Rio Bravo’ does not abandon those who occasionally fall and shrug them away with glib justification about jungles and progress. True, John T Chance is resolute and courageous but his dismissal of danger as something that the job entails denies him being a conventional hero. If he is important, it is because he is a leader who gives a chance to others, allows the weaker and those who have made mistakes to try again. And he will not only support his flawed comrades but also stake his life on their willingness to prove themselves and relinquish their past. Two members of the group are handy with a tune, and the rumour that the part of Colorado was originally offered to Elvis tantalises. The two songs that the group sing in the jail assure us that if human beings are supported and encouraged with responsibility rather than simply left to fend for themselves they will achieve self-worth and a harmony that transcends not just sordid self but existence and the defeat imposed by death and time. This scene is as important as any in the film. The final gun fight is entertaining and well done but we soon realise that the villains are no match for a small crew who have decency, mutual respect and integrity. The villains surrender, hands in the air, exposed as incompetent bullies, men who are nothing without power. The bigger battle for Chance was the capture of the harmony that allows human beings to work with others and honour themselves with both responsibility and equality. The group in ‘Rio Bravo’ do this. This is the glory of John T Chance, a true hero and not a mere fantasy for individualists. If you like gothic horror click here. Another great movie…Hawks did this movie in response to High noon where the Sheriff was abandoned by the towns people when a felon he incarcerated to keep the town safe, was coming back to get him. Everyone abandoned him though he ran helter-skelter seeking help, in the final showdown it was his fiancee whose religion forbade violence, that put aside her beliefs for her love to help him, this tried to reflect the McCarthyism era. Hawks rejected the idea that a frontier Sheriff would run around town seeking help hence John T. Chance did not seek help, he even rejected Colorado’s offer, the towns people all pitched in to help the Sheriff unlike in High Noon. Ricky Nelson, even at that tender age was an experienced actor…I don’t think Elvis would have played Colorado better. Nathan Burdett and his crew kind of celebrated death when he and his crew played ‘”De Guello” which means slit throat (Santa Anna’s Mexican army played this everytime before bombarding the Alamo).